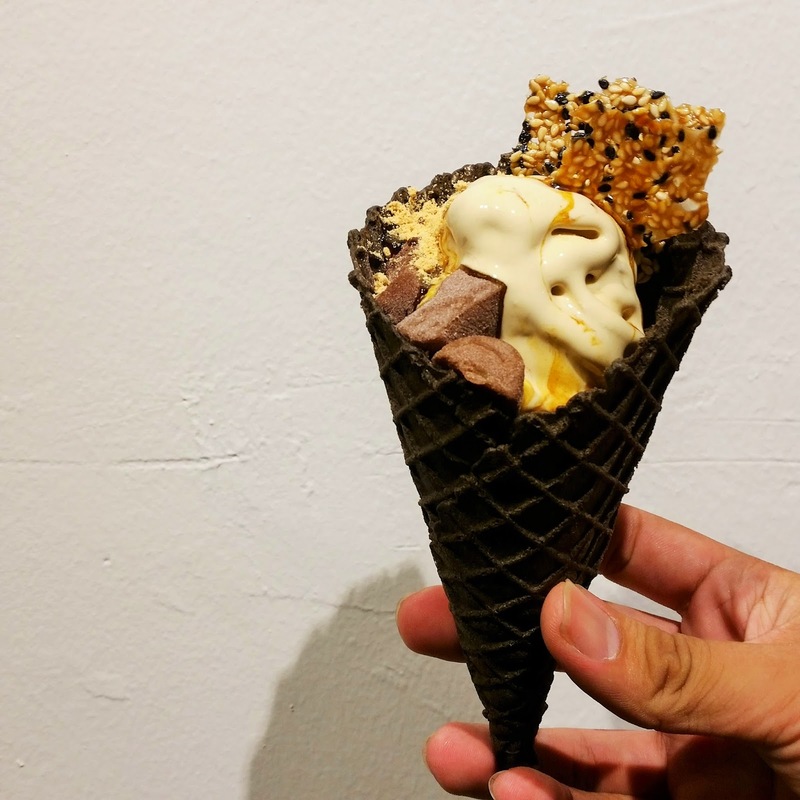 Sunday Folks is Creamier's sister cafe, specialising in soft serve ice cream! They opened about a month ago at a slightly more convenient location and more importantly with a bigger space! As you can see from the above photos, they have many more seats and it's much more spacious than Creamier. Stark contrast, definitely. Some cakes that they sell. These are the toppings that you can choose to add on your waffles/ice cream cone. These are the soft serve ice cream dispensers. At the moment they only have 6 flavours: Seasalt Gula Melaka, Earl Grey Caramel, Dark Chocolate, Roasted Pistachio, Summer Berries and Madagascar Vanilla. These are their popular flavours over at Creamier. Cute little birdie as the tap for the water dispenser haha. Here's what we got! 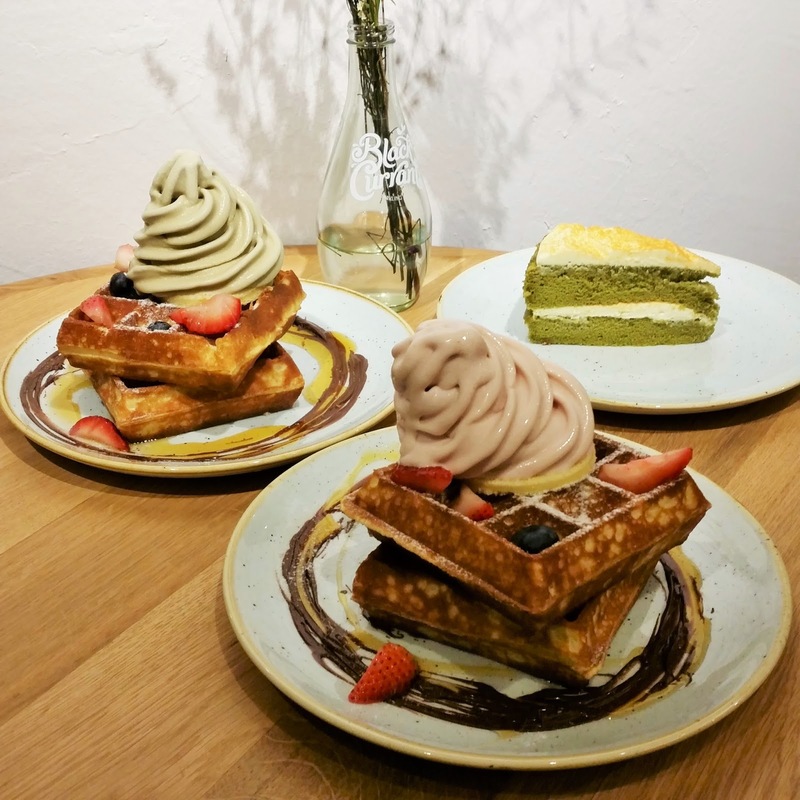 Two soft serve ice cream waffles plus a Japanese Matcha cake for Zipeng. First thing: the presentation. It's similar to that of Creamier's so it doesn't disappoint yay. (: The waffles look so pretty topped with the nicely swirled soft serve ice cream! 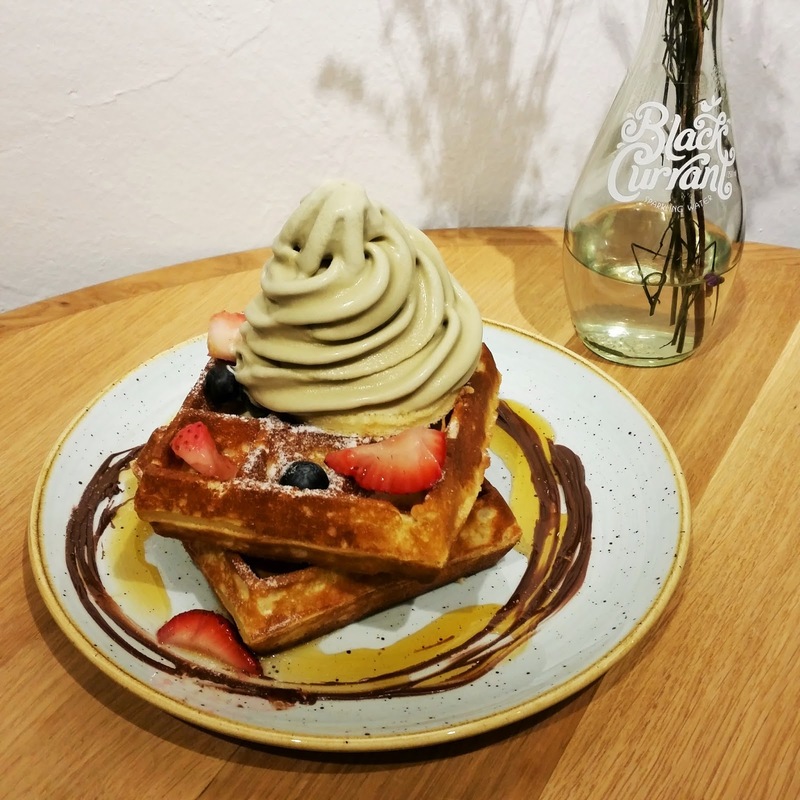 If you notice they also placed a thin slice of swiss roll-like thing between the soft serve and waffles, apparently to prevent the soft serve from turning the waffles soft. I'm not a fan of matcha or anything related to Green Tea, so I don't think I should comment on this haha. 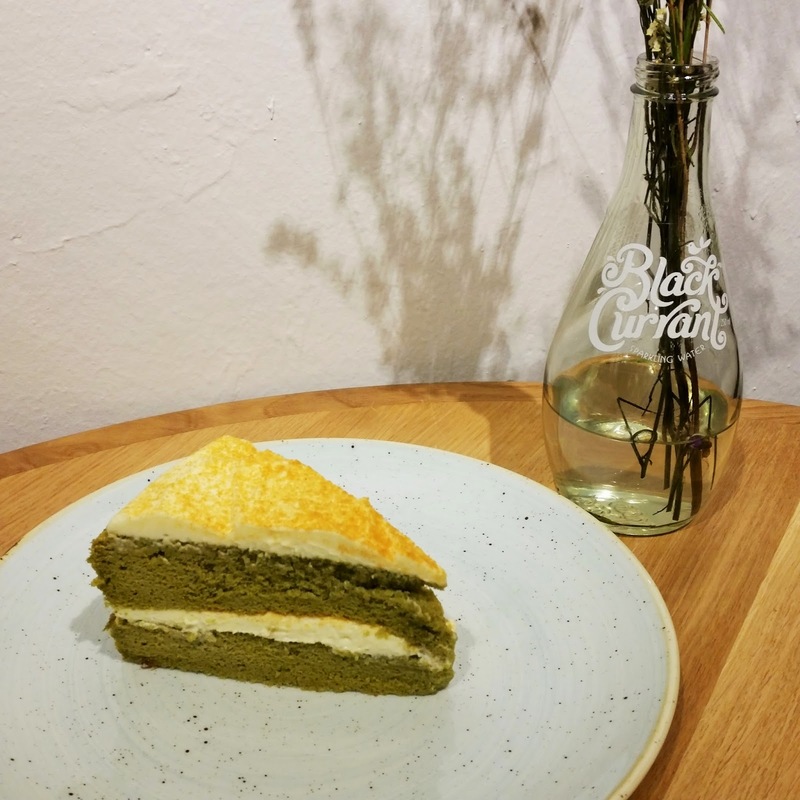 But I heard some matcha lovers raving about this, so perhaps it's worth a try. ZP got this cone after that haha plus some toppings which I don't know what they are lol. The cone was very nice though! Sunday Folks has been having great business ever since they opened, and it gets super packed during the peak hours like Friday or weekend nights. I think even weekday nights are also crowded. I've heard that waiting times for the waffles can go up to 45 minutes! So yeah, if you want to go, either go during an ulu time or be prepared to wait long. The ambience there is good, very relaxing, but the opposite when it's crowded (which is almost perpetual). Creamier's customers will probably hop over to try it out so I guess the crowds are here to stay haha! Personally I don't find it super good that I'll go back for a third or fourth time. But I must say their waffles are very nice and crispy, one of my personal favourites! 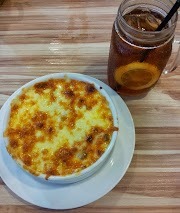 It tastes the same as that of Creamier, so thumbs up for the consistency. 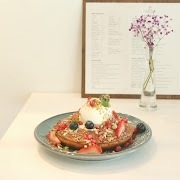 Hmm maybe I'll go to Creamier instead if I crave their waffles, since it's cheaper there as well.